Hey everyone, sorry I've been so slack lately keeping this blog up to date,things have been hectic the last couple of weeks. But finally here it is, our blog of the week, and only a week and a half late! Don't forget to check back soon for the March Challenge. Have a good weekend, can't wait to catch up with some of you at the New Plymouth Training on Saturday! 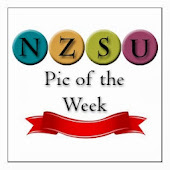 This week Jacquelyn Pedersen's blog Stamp Happy NZ is our blog of the week. Not only does she create some amazing cards and 3D items like the one featured, but she has also had her work published!! Check out Jacque's card in the latest issue of New Zealand's Scrapbooking Mag UP2 Scrap. There are also some other good SU promos. This last week we made two milk cartons, a very FUN twist on the standard box. The template is quite easy, just a few extra diagonal creases to make this unique top. This one uses the Soft Subtles colour range and two of the Saleabration sets, Freindship Blooms and Lots of Thoughts, both of which can be earned for FREE with a qualifying order. The great thing about this flower is that it's so easy to cut out. I've added some accents with a white gel pen and one of the flowers from the Spring Bouquet punch. Lots of Thoughts is really versatile because you can use your Stampin Up! markers to use just portions of each stamp, as shown in this sample. Hurry! These are only available until the end of February! This post is from Louise's blog. She's used one of my favourite stamp sets. This is my entry for the weekend SCS sketch challenge. I love the Giraffe, it is from bundle of love which was a set available back in the spring catalogue. I can't stop using this one though. I like this set alot more than the baby sets in the idea catalogue. I bought the Sarah dp for the mini book class I am holding next week, but I just couldn't resist opening the pack I fell in love with this paper in particular. I am mad on paisley! I am submitting a card I have made using the gorgeous French Flair background gold embossed onto Vintage Violet cardstock. Added the ribbon before mounting onto the metallic gold cardstock card then added embellishments. Inside of card has a cream parchment insert with the bird from my matching Carte Postale set stamped in gold in the top right hand corner. This was a reasonably easy card to make but feel that it appears more complex than it actually is. I really love this stamp and the matching Carte Postale set. I made this to send to friends later this month for their golden wedding anniversary. Gotta love those water colour crayons!! Here's Sharlene's Entry. You can check out more of her creations at Magpie Creates. Wow! Tracy was fast getting her challenge entry in. Here it is, check out more of her cards at Stamping All Seasons. Here's my entry for the February Challenge, it's an engagement card for a friend. The verse was printed on vellum using my printer.